Performers must be registered no later than Friday, April 19th. 1. All work must be original. Poets should bring two prepared pieces. 2. Poems must be memorized. 3. 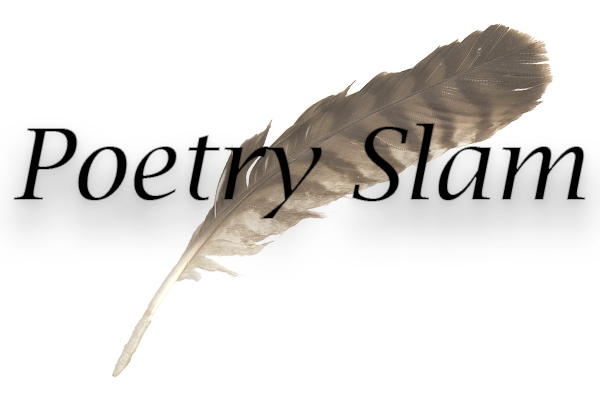 Poems must be under 3 minutes, with a 10 second grace period. 4. Poems over 3 minutes will receive a .5 point deduction from their averaged score for every 10 seconds after the grace period. 1. Five judges are selected at random from the audience. 2. Judges will rate each poem performed on a scale of 1-10. Judges may use one decimal place, for example 7.4 is an acceptable score. 3. Scores will be determined by dropping the lowest and highest score and averaging the remaining three scores. 4. A “sacrificial” poet, who is not enrolled in the competition, will perform a piece first and receive a score from the judges. This provides the baseline that all other poems should be judged against. 5. The five highest scoring poets will perform a second piece in a finals round to compete for three prizes. For questions, please email Cassie at cassie@anunlikelystory.com.